St. Luke's Half Marathon | Run S.M.A.R.T. 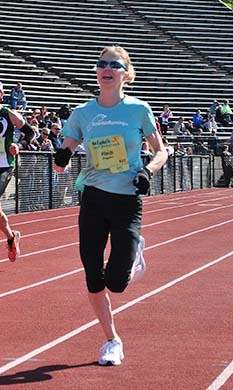 Run SMART coach Heidi Peoples won the St. Luke’s Half Marathon in Allentown, PA! Heidi finished almost 3 minutes ahead of the next female runner and was 15th overall out of a record 3,217 runners. Her official time was in 1:17:47. [Results] Not bad considering she gave birth about 6-months ago!!! Peoples, coming off the birth of a daughter sixth months ago, had a 30-second lead over Jobes after three miles and kept building it throughout the race.